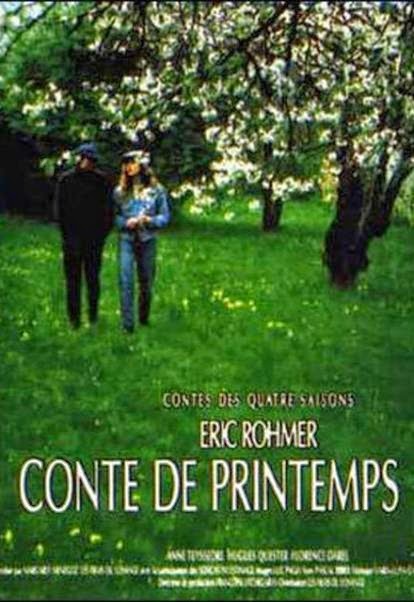 A Tale of Springtime marked the beginning of Rohmer’s late-career ‘Tales of the Four Seasons’, his 3rd and final movie series, and his distinctively Rohmersque examination of the frailties and vagaries of the heart with the titular weather providing key tonal backdrops for the respective films. Jeanne (Anne Teyssedre) is a beautiful, intelligent and self-assured philosophy teacher at a Parisian school who’s looking for temporary accommodation as she’s lent her apartment to a friend. At a party she makes the chance acquaintance of Natacha (Florence Darel), an impulsive and childish young music student in her late teens who immediately likes Jeanne and invites her to stay at her place. As it turns out, Natacha’s divorced father, Igor (Hugues Quester), a 40-something bureaucrat, is having an affair with 20-year old Eve (Eloïse Bennett) who Natacha despises for various reasons, further fuelled by her conviction that Eve has stolen an expensive necklace that Igor was supposed to gift her. So, since Jeanne is ambiguous about her relationship, Natacha tries to get her linked with her father. The messy family details that Jeanne becomes unwittingly a witness to is compounded by the discomfort at Natacha playing the cupid, and these provided the driving forces for the character and interpersonal dynamics that the story focused on in order to reinforce its theme. As is common in Rohmer’s filmography, the dialogue-heavy plot had its share of coincidences, happy accidents and deux ex machina to both elevate and resolve tension, and the aesthetics were marked by a near-static camera and near lack of non-diegetic sounds. Though a lesser work in his canon, the charming set-up, controlled displays of emotions and the striking presence of the ravishing protagonist, made it noteworthy. ".....and his distinctively Rohmersque examination of the frailties and vagaries of the heart with the titular weather providing key tonal backdrops for the respective films...."
Beautifully written observations in the latest of your magisterial Rohmer series that dates back a few months at CINEMASCOPE. I much agree that this is one of his lesser works, but still there's a lot to recommend here. Thanks a lot Sam, and I'm really glad to know that you've followed my dabbling with Rohmer over the last couple of years. Its a lesser Rohmer for sure, but even a lesser Rohmer provides more delightful moments, insights & interludes than most.